The food and beverage menus at Daisies change so frequently, guests barely have time to blink. The produce that is in-season runs its course, eventually clearing the way for the next season’s gems. 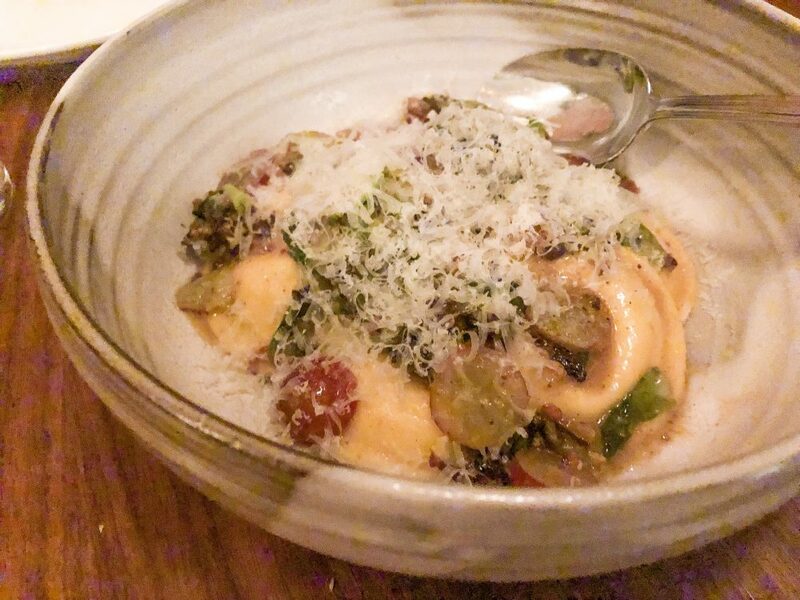 One visit you’ll indulge in a bright and late-summer Black Truffle Ricotta Ravioli decorated with corn, cilantro and cheddar; on the next, it’s replaced by a dreamy ravioli blanketed by brussels sprouts shavings, bits of bacon and slices of sweet red grapes ($25). The only solution is to habitually dine at this small-seat, Logan Square restaurant to be sure you never miss a dish. 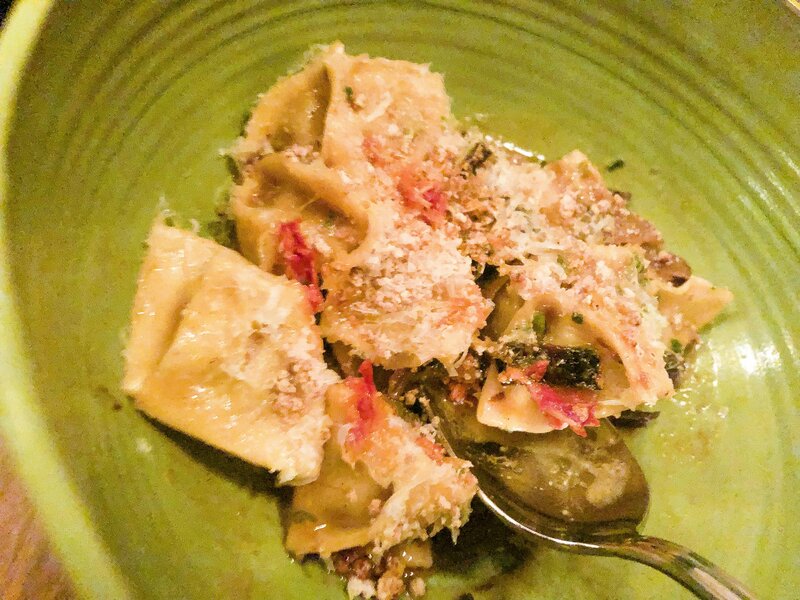 The menu during our recent visit to Daisies featured the remnants of winter’s best veggies with teases of spring flavors layered in amongst the pasta-heavy offerings. Guests are encouraged to order multiple dishes to share and dishes are typically portioned to accommodate the party size. Therefore, there is never too much or too little food on the table at a time. If ordering any starters, don’t pass on the Fried Mushrooms and Cheese Curds ($12) an appetizer that would make any Wisconsinite proud. 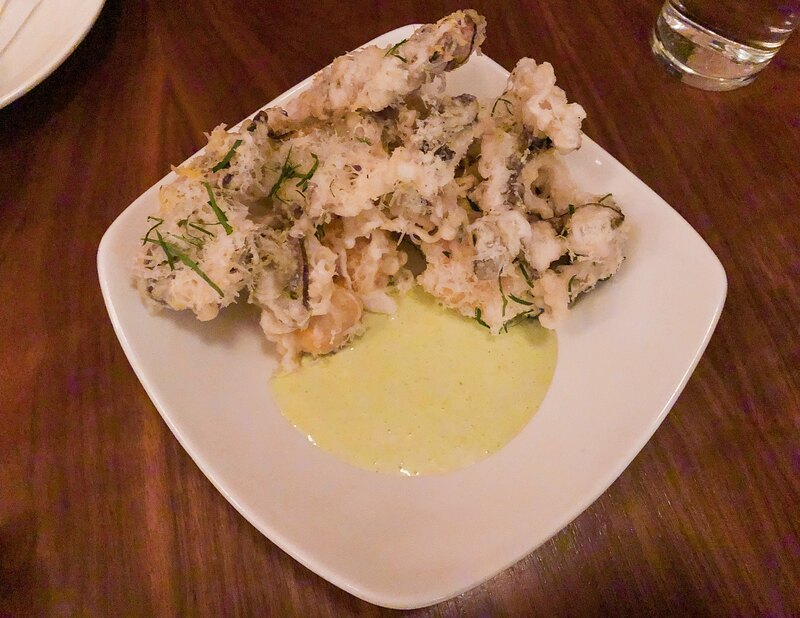 Though the presentation isn’t the most beautiful, the light breading on the shrooms and curds is packed with tons of unexpected umami flavor. We didn’t even need to dip them into the puddle of accompanying Buttermilk Tarragon Sauce, they are incredible on their own. The wintery Parsnips ($12) also shine on the starters menu particularly because of the mouth-watering subtlety of the fried duck cracklin’ hidden amongst the vegetables. Calabrian Chiles give the dish a sweet kick while pine nuts deliver the perfect amount of crunch. Aside from the aforementioned ravioli, for an unconventional entrée, we recommend the Manti ($20). This dumpling-like pasta is stuffed with pureed winter squash, pureed until soupy. The smoked red onion scattered on top is what really makes this dish, allowing a sweet but sharp contrast to the salty parmesan and neonata (baby anchovies) that it shares the bowl with. One of the rotating proteins currently on special is the Lamb ($29). Sourced from the southern coast of France where the animal’s diet partially consists of seaweed, the meat itself comes off saltier than normal. The “salty” leg and shoulder cuts of meat lay atop a generous scoop of polenta and is dressed with parmesan, slices of radish, pickled onions and rhubarb. As for dessert, Daisies did not have their heavenly-sounding Rhubarb Crostata ($12) with ricotta and black walnut syrup, available during our visit. 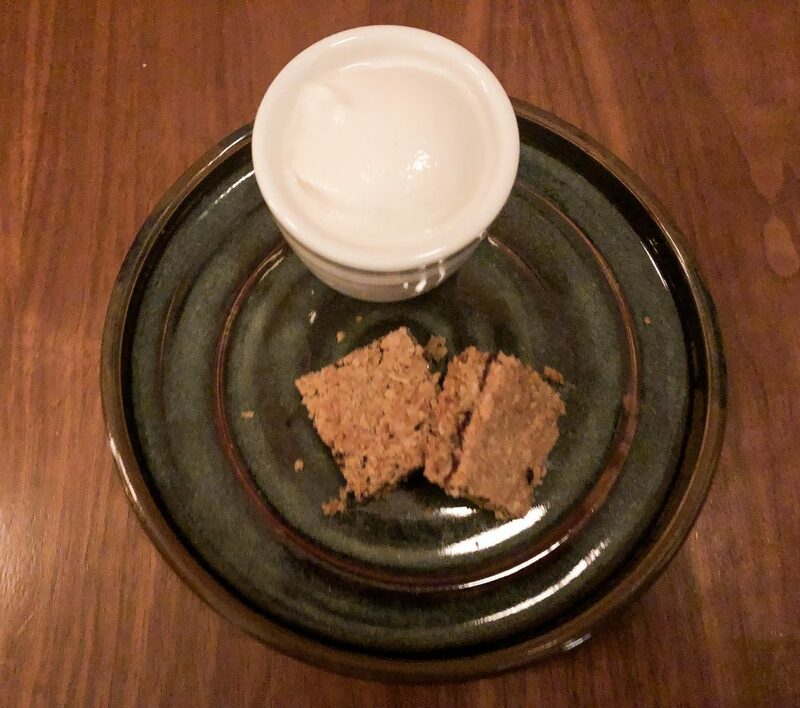 However, after a little dessert roulette, we wound up with a light and satisfying Raspberry Oat Square ($1) served with a scoop of their must-have Whiskey Ice Cream ($2). The cocktails (all $11) get the sustainable, in-season treatment as well. Some version of the Cucumber Drink is always available and currently features local Koval Vodka, tequila, lime, cucumber and soda water. The HIGHLY recommended Pretty Rad is a mix of smoky mezcal, cocchi americano, celery root liquer, verjus and adorned with a radish. Daisies is located at in Logan Square at 2523 N MILWAUKEE AVE and is open Wednesday and Thursday 5-11PM, Friday and Saturday 5-10PM and Sunday for brunch 10AM-2PM and dinner 5-10PM. The restaurant is closed Monday and Tuesday.